My portraiture, fashion, landscape and fine art photography has been featured in some of the photographic industry’s best known journals. Until relatively recently animal and pet photography (at least in the domestic sense) was regarded as something of a niche subject. It’s always been well accepted that your dog can be transported to the local photography studio and posed (if your pet is especially obedient) in front of a traditional background for a classic portrait. I often create similar studies on location. But in my experience most pet and animal owners love the more characterful pictures of their animals, showing their personalities. I’m sometimes asked to talk about how I approach my work in the field - whether my subjects are humans or their furry friends. As one of the most prestigious photography magazines in the world it was fantastic to be asked to contribute to the June 2015 edition of the The Journal. My three page feature was in the subject was fine art portraiture of pets and animals, and how we can overcome the many constraints we might face. During my time as a brand ambassador for Olympus UK one of my most enjoyable outings involved taking part in the speaker lineup at The Photography Show, held at Birmingham's NEC. This is a huge event attracting the world's best known speakers - it was a privilege to be invited to join the list of educators. My talk was about how to find and photograph animals in a country where wild creatures can be in short supply! This heavy, glossy magazine has got to be one of the most informative journals in the industry - packed full of interviews and articles covering every aspect of professional photography. 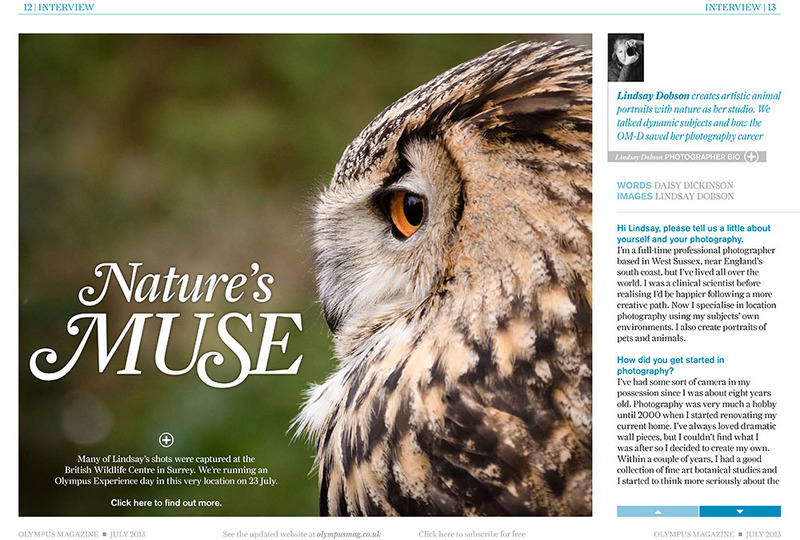 I was delighted to be the subject of a substantial four page feature detailing the ins and outs of animal photography. It's an area some portrait photographers will naturally want to incorporate into their offerings, but it's also a subject many photographers will find frustrating. Pet and animal photography on location has its constraints and at times it can be frustrating. In this article for Photo Professional magazine I share my tips for getting the best out of your pet portrait photo sessions. This is the place to be if you have an interest in all things 'mirrorless'. As one of the first professional photographers to adopt smaller mirrorless cameras full time, I'm often asked to talk about my work. Debunking some well worn myths was inevitably a large part of that. Mirrorlessons is a fantastic resource for all the news on the latest mirrorless cameras and lenses, with plenty of well written real world reviews. Along with three fellow Olympus Ambassadors, I was tasked with being both a judge and mentor for the category we represented. From the thousands of entries, this was no easy job! I was in charge of teaching my protegee the finer points of pet and animal photography. One of my more interesting roles as an Olympus Ambassador lay in acting as a judge and mentor for the winner of the animal photography phase of the Protegee Campaign. It's a bit like the photography version of the X factor. If you're part of our industry you might recognize my colleagues Lord Kerry (fashion), Mark Cargill (landscape), and legendary rock photographer Mick Hutson. Having been one of the world's first professional photographers to adopt the Olympus EM-1 camera, I was asked to talk about why I felt it was the ideal tool for pros. This four page advertorial was also run in Photo Professional Magazine and Amateur Photographer magazine. As a great believer in the many benefits of converting to smaller mirrorless systems, the Olympus Magazine asked me to talk about how I use their cameras and lenses on location to photograph pets and wildlife. This 7 page feature is packed with tips to help you improve your nature photography. In an interview about my human portraiture (of which I do a great deal) I talked about how perfect smaller cameras and lenses can be for portrait photographers. Not everybody likes having a great big DSLR shoved in their faces (especially children and small or timid animals) and discreet equipment can sometimes make our job easier. Not to mention less tiring!